If you close your eyes for a moment and think back over the course of the last six months, what would you be thinking about? Would you be able to separate in your mind all the events that had occurred? Or would it just be a big blur? When I look back over the past six months, it’s a big blur mixed in with worry and at times adrenaline spikes. I have received a lot of emails from people asking about different people we’ve helped from the Camp Fire. So this lets me know that there are other people worrying too. Did you donate and then wonder where we were at? Have you been following the stories, kind of confused that some of the news coming out of the Camp Fire doesn’t seem to be news of huge successes, but stop and start and stop again success? Since the beginning of this journey we have helped an incredible amount of people. Too many to list. We have experienced sadness and set back together as well as the blessings of watching somebody rebirth their life. I can’t speak to all the stories you’ve heard as to what is going on with the Camp Fire. I don’t pay attention, nor do I really read them. I can only attest to the work we have done together and our own focus on providing solutions. I so want to someday write an email that has no mention of tragedy or hint of sadness. But we started this journey together in helping those from the Camp Fire and while there has been so much success we still can’t escape the constant drumbeat of sadness. I’ve spent the last six months plowing through these things and constantly looking forward. I did this with your help, trying not to look back and when I was forced to look back or circled around to a place I thought I never had to go back to, we together went back in with great resolve, bigger solutions and a commitment to finish what we started. So, if I may I’d like to take a moment to update you on where we are in our journey of hope and helping those in need. – Sadly, funds are being raised to help a lady married 61 years to cremate her husband. This fire continues to claim people. I don’t know what else to say about this other than I come across this a lot. The evacuation, the stress it created, and the conditions that exacerbated those with health concerns are continuing to take a toll. Together, we have paid for cremations and taken a bit of a burden off in time of need. – A lot of people took in survivors onto their property and into their homes. I thought, “What’s going to happen when these people have to leave and have nowhere to go?”. You can only sleep on somebody’s couch for so long. You can only pay for extra food and utilities for so long. We are paying for some of these utility bills to help relieve the stress while trying to come up with better solutions for people. I always felt new needs would come up and they are. I knew it would be like a merry-go-round spinning, occasionally letting the horse go loose and we would have to find a solution for the horse. 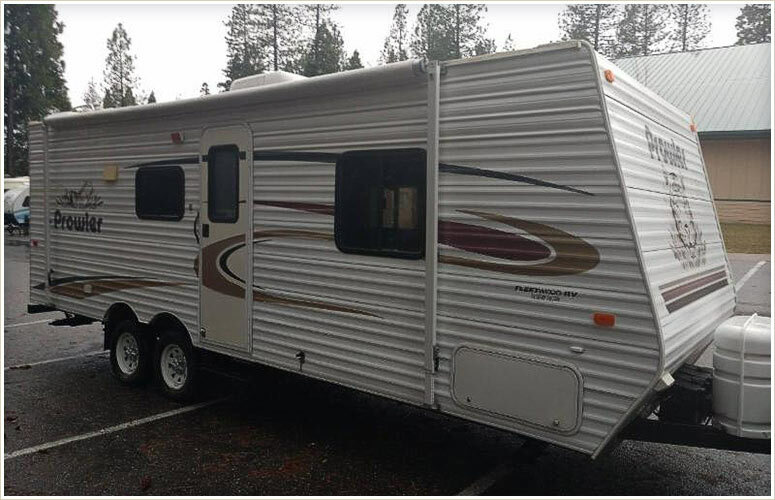 – Recently we have paid a past due utility bill and are preparing a vehicle so that a young mother can take her trailer and drive out of state. Her two-year old child was sent to family after the fire. Your donations are now going to reunite them in the coming days. – This is not the fresh catch of the day, but the start of a new life. This gentleman lost all his logging equipment in the fire as he evacuated. Your donations helped get his dignity back. They helped him to get a job. 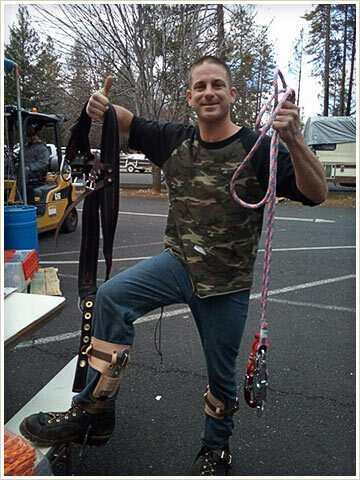 His new boots and climbing gear have started him on his journey of taking care of his family again and moving forward. Thank you for that. – March 27th, we are happy to say that we are taking down the tent at the church. We will still be feeding about 300 meals a day, but are consolidating into a smaller area as the weather improves. Tony and the team at Celebrations in Roseville, thank you. Your tent, tables and chairs and heater have provided warmth through a long, snowy winter. I don’t know how we would have fed so many people without it. We have served over 50,000 meals to date. Thanks, Tony. Thank you, Produce Express and Reed’s Meats and your continued support in helping those in need. – I had said in the past that I thought that the removal of the tent would indicate a turning point and it is a shift into our next step. We are going to shift our services into a resource center. This center will provide folks with the ability, once vetted, to get individual needs met. One size doesn’t fit all. We can provide basic necessities that will help people to get to the next step. There could be a pot of gold a mile away, but if you don’t have the means to get to it, all you can do is sit and stare at it. It is fashioned after the very thing we have been doing all along. Identifying a need and fulfilling short term needs to get people to the next step in their lives. – Water. Teigert has done an incredible job stepping in and helping to take the burden off of us. Paula from Teigert and Nichole, my assistant, work seamlessly together to put the logistics together. It works like this. Paula from Teigert confirms that Sam’s has the water in stock. Paula emails Nichole, my assistant in the office here at High-Hand. Nichole arranges for payment and notifies Paula that we are good to go. Paula then notifies their mobile equipment department, who then sends a truck and delivers the water to Magalia. Every other week Teigert and one of their partners, Pacific Coast Building Products, pick up water and deliver it to Magalia. Quite a bit of logistics. Behind the scenes, Judd, Paula and Nichole have been doing a wonderful job. Which brings up something I haven’t mentioned. Nichole runs my office. She runs all the accounting, payables and receivables and payroll for a company of 60 employees and 4 businesses within it. She has, without question, taken on the business of working behind the scenes to make all this happen, supplying logistical support, tracking down paperwork and fielding phone calls. As I sit and ask myself about the events of the last six months, through my personal blur one thing shines brightly. It’s all the great people here at High-Hand who have taken calls and jumped in with their sleeves rolled up to keep this all moving smoothly. They weren’t told this was coming and when it came they jumped in without question. To Nichole, the team at the nursery and cafe, thank you so much. To Celebrations, Produce Express, Reed’s Meats, Teigert and to so many of you who have donated, thank you. I don’t know what else to say other than “thank you”. – A young mother and her children moved into their new trailer. They had been sleeping in a car. They are no longer, thanks to your donations. Please understand that these situations after all these months still exist. While we’ve had our eyes down moving forward helping as many people as we can, every time we look left or right, we find new needs. A military veteran keeping warm by candles in his trailer has a generator and a supply of fuel. Just trying to get to Spring. It looks like Winter hasn’t given up yet. But Winter is up against Time, and Time will win, if it hasn’t already. Today, Wednesday, March 20th, at 2:58 p.m., Spring started. Winter’s days are numbered, as well as the suffering of people trying to stay warm. – Yesterday, we purchased 100 propane tanks. They cost $50.00 each. A propane company up in the area has agreed to fill them and refill them for free. These tanks are being loaded up in a pick-up truck and delivered to people who have no means of refilling their tanks. Concow, a town on the back side of the fire, is such a place. Tanks are loaded into a pick-up truck and the routes are made. I just want to thank the propane company and a very hard working lady for making all this happen. – Luke and Colton’s tiny house is almost done. We are building another for an elderly lady and her two dogs and a third for a young family. You and I have committed to three more homes with more on the horizon. Alicia is working hard to coordinate all this. To finish the two other houses, we will spend an additional $5,500.00. – A gentleman who owns a custom door shop has agreed to build all the front doors to the tiny houses. Sir, I don’t know you, but thank you very much. WHERE ARE WE AT AT HIGH-HAND NURSERY? Throughout the winter, we have been growing and growing and growing. Our greenhouse is full with the latest flowers surely to make anybody smile. I’m not trying to guilt you, but if you do happen to make a “volunteer donation” while picking up your “free” tree while supplies last, that money will be used toward our Camp Fire efforts. This will be this Saturday and Sunday, March 23rd and 24th, while supplies last. See Adrian. He’s the answer man with a big smile, always. This weekend, Dory has five seats left for the first class of Spring. 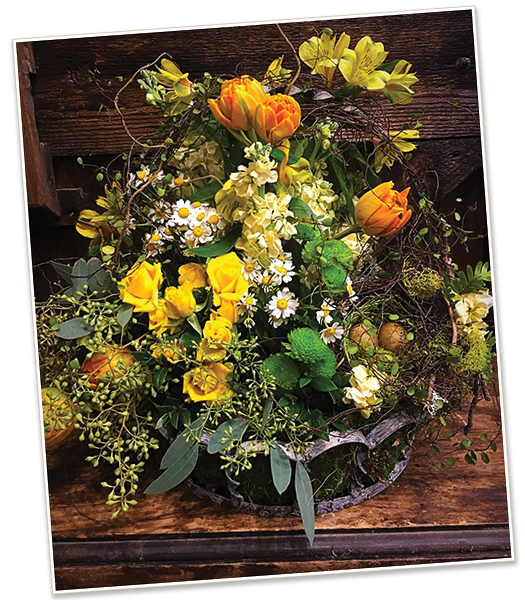 Saturday, March 23, beginning 10:00 a.m., join us for a Springtime Fresh Floral Centerpiece. Reserve your spot by clicking here. Tickets are $65, plus tax. 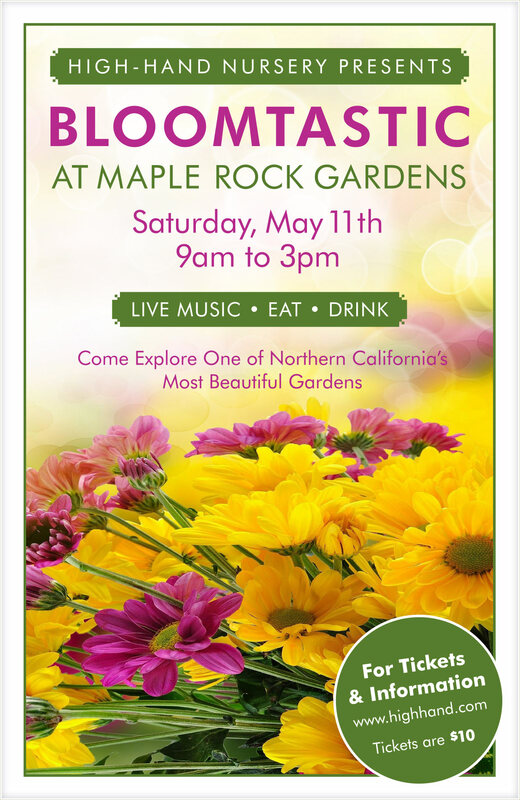 Mother’s Day weekend, May 11th, Bloomtastic arrives, 9 a.m. to 3 p.m. Tickets are $10.00 and can be purchased online by clicking here, at the nursery, or at the gates of Maple Rock Gardens. It’s a great time for all. Come and enjoy the freshness of Spring at Maple Rock Gardens. WHAT’S AFTER MAPLE ROCK’S BLOOMTASTIC? Succulents. That’s what’s next. 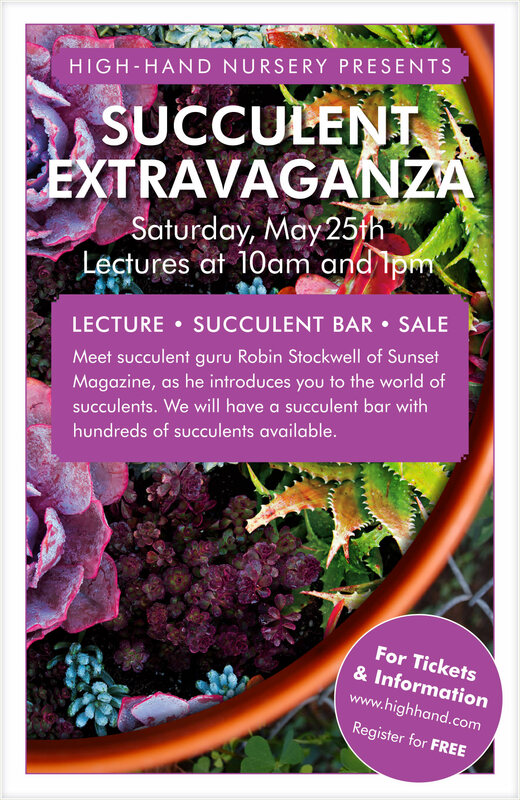 Join my friend, Robin, Sunset Magazine’s succulent guru and learn all about succulents in one of the two lectures. Click here to learn more and reserve your seat. Obviously, we will have a lot of succulents for sale. Belly up to our succulent bar, bring your creativity and pot up your own succulent creation. This event is free. Don’t miss out. Well, that’s where we’re at. I can’t thank you enough for your continued support of our efforts in the Camp Fire. I look forward to seeing you at High-Hand Nursery. Preheat the oven on Broil and position oven rack about 5″ from heat. While you are preparing the other ingredients, spread a sliced baguette on a baking sheet and lightly toast the bread under the broiler. After the bread has been toasted, lightly rub each piece with a raw garlic clove. Next, spread the cubes of cheese in black cast iron skillet and drizzle with ¼ cup of High-Hand Olive Oil Company Spanish Hojiblanca Extra Virgin Olive Oil. 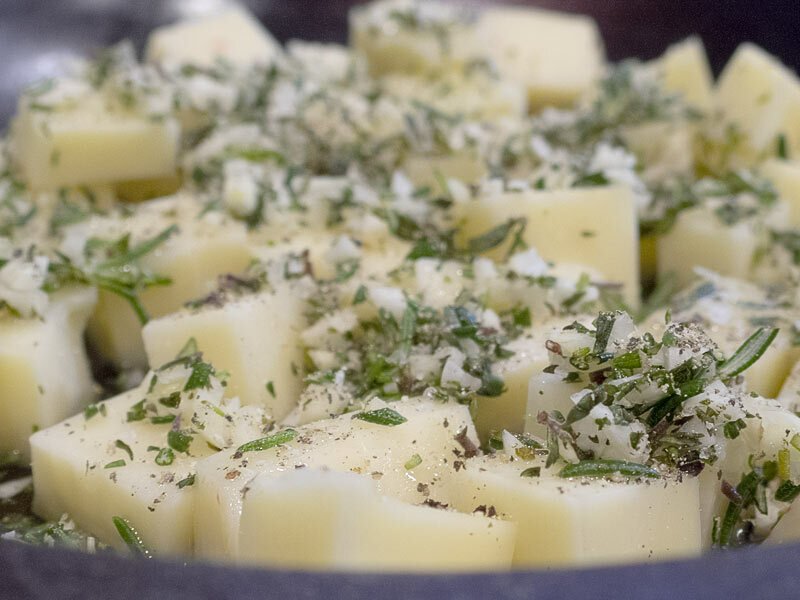 Combine the garlic, thyme and rosemary and sprinkle over the cheese. Then, sprinkle with salt and pepper to taste. Place the skillet in the oven, under the broiler for 6 minutes, or until cheese is melted and bubbly and starts to brown. Serve immediately and enjoy with sliced baguette and a drizzle of High-Hand Olive Oil Company Fig Dark Balsamic Vinegar on top. Note: You can change the flavors of this recipe by using other High-Hand Olive Oil Company oils and balsamic vinegar, or by trying other cheeses.